The American Eskimo Dog is a member of the Nordic Spitz family. They have fox-like faces, tails carried over their backs, pricked ears, and a thick coat. The true origin of the American Eskimo is not known. They were first found in the United States in German immigrant communities. These dogs were most likely descendants of the white German Spitz, large white Pomeranians, or white Keeshonds that came to America with German emigrants. They came to be known as American Spitz dogs. 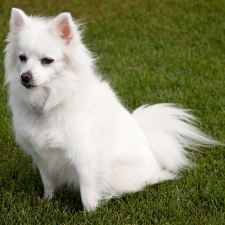 However, due to anti-German feelings during World War I the German Spitz name was changed to The American Eskimo Dog. The American Eskimo Dog possesses a winning personality and makes a wonderful family pet. They are devoted to their family and are cheerful, curious, spunky, and very intelligent. They are thought to be one of the most intelligent of the dog breeds. They are excellent with children as they love to play. American Eskimos are easy to train and do well in obedience training. They are excellent watchdogs and will announce the comings and goings of everyone with a lot of barking. They are very active and like to keep moving. The American Eskimo Dog comes in three sizes: toy, miniature, and standard. The toys usually weigh up to 10 pounds and stand about 9 to 12 inches tall. Miniature American Eskimos weigh up to 20 pounds and stand about 12 to 15 inches tall. The standard usually weighs up to 30 pounds and stands approximately 15 to 19 inches tall. They are beautiful dogs with a profuse coat that is always white or white with cream markings. Eskies were once favorite circus performers. With their ability to learn quickly, perform tricks, and their beautiful looks, they traveled throughout the United States in the late 19th century wowing people everywhere they went. This was one of the reasons that the American Eskimo dog became so popular.